Hiking in wet weather can provide a whole host of challenges for the thru-hiker and day-hiker alike. When well prepared, there are few things that bring one’s senses to life like a mountain stroll in a downpour. I’ve tried all sorts of “waterproof” wet weather gear over the years, and have finally found my ideal gear setup. I’ll write about other pieces I use in other posts, but for today, I’d like to focus on my homemade Tyvek rain kilt, and offer some instructions if you’d like to make one for yourself. Support Trail to Peak by purchasing your supplies at Amazon using the links below. You might be asking yourself, “Why a rain kilt, why not just wear rain pants?”. The answer to this is simple, and follows the same logic I use when addressing the problems with Gore-Tex footwear. With Gore-Tex footwear, the intent is to have a membrane in the shoe that water cannot permeate. This can work well for some conditions, but it’s important to keep in mind that it will also keep water in. Waterproof shoes can take days to dry. They’re also a nightmare to wear in warm weather, as they don’t allow your feet to breathe (despite marketing claims). I found the same issues to be true with rain pants, as I sweat myself to a soaked state in any temperatures higher than 45 F. It’s like wearing a wrestlers weight-loss suit. In cold snowy weather, I think Gore-Tex shoes and waterproof pants can work really well, but for 3 season hiking and backpacking, I much prefer the more breathable options. Rain kilts are very lightweight, with my Tyvek option coming in at 2.48oz (69g). Rain kilts pack up very small, and take up very little space in your pack when not in use. Rain kilts are easy to put on and take off, saving you time and keeping you dry when showers come and go. Rain kilts are cheap and easy to make. Rain kilts are waterproof and durable. Rain kilts can double as a waterproof picnic seat or ground sheet when all of your surroundings are wet. Julia and I used homemade rain kilts on the John Muir Trail this summer and absolutely loved them. We covered 25 miles on our first day out of Yosemite Valley, with about 15 of those miles in the rain. I loved how comfortable and breathable the kilt was, and more importantly, how dry my legs were. 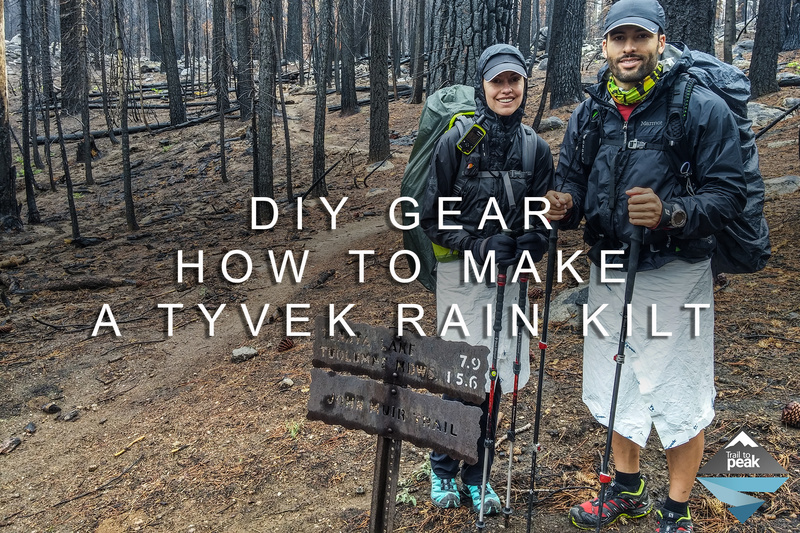 If you’re looking to make your own rain kilt, like the one I made for the John Muir Trail, all you’ll need is some Tyvek, tape (I like Tyvek tape), a pair of scissors, and some Velcro. You can buy all of these supplies on Amazon and support Trail to Peak at the same time. You’ll have to buy most of this stuff in bulk. Purchasing the minimum quantity available for each item still leaves you with enough for 2-4 kilts. The tape and velcro is enough for 5-10 kilts. If you want to purchase items in smaller quantities, you can try Michaels craft store. To start, I’d like to explain why I chose Tyvek as a base material. If you’re not familiar with Tyvek, here is a description from Wikipedia: “Tyvek is a brand of flashspun high-density polyethylene fibers, a synthetic material; the name is a registered trademark of DuPont. It is often seen used as housewrap, a synthetic material used to protect buildings during construction. The material is very strong; it is difficult to tear but can easily be cut with scissors or a knife. Water vapor can pass through Tyvek, but liquid water cannot. All of these properties make Tyvek useful in a variety of applications.” You can also use materials like cuben fiber and silnylon, but the cost and effectiveness of Tyvek makes it pretty tough to beat. I bought 3 meters of Tyvek on Amazon for $16.00, which was enough for 2 kilts and a groundsheet for our tent. Once you get your master sheet of Tyvek, cut it down to match your preferred dimensions. I cut mine down to 53in by 28in. I stand 5’10.5″ and have a 31in waist. Start with a larger cut by about 2 or 3 inches for width and height, and then cut it down more, as needed. When your kilt cutout is sized and ready, you’ll want to add a little tape to the corners. You can skip this step if you’re really looking to cut weight, but I’ve found that the tape really adds life to the kilt and also keeps the edges from flapping in the wind. After you’ve added tape to the edges of your Tyvek kilt, you’re ready for the final step, adding a Velcro fastener. I like to make my fastener in two sections, to allow for a more “dialed in” fit. You can do this in many ways, just make sure not to go too light on the Velcro, as you don’t want this coming undone while you’re out hiking. To get the positioning right, try on your kilt a few times, and wrap it around your waist for a comfortable fit. Once you’ve done this, take a pen and mark the kilt just below your navel. This is where you’ll want to put the loop(fuzzy) side of the Velcro. I used a large piece measuring 7 inches. Once you have the loop side of the Velcro attached, try your kilt on again, and mark your kilt for the hook side of the Velcro. As I mentioned above, I do the hook side of the Velcro fastener in two sections to get the best fit. Once you have the hook and loop side of the Velcro attached, try it on and make sure you have a snug but comfortable fit. That’s all there is to it, you’re ready to take on the storms now! One word of caution when using your rain kilt is to unfasten it with your fingers on the Velcro and not on the Tyvek. I learned this lesson the hard way on my first kilt as I watched the fibers tear apart. Even with this tearing, the kilt still kept me dry through quite a few storms on the JMT, and aside from this issue, the kilt was flat out bomb proof. Feel free to ask me any questions you may have, and make sure to share your pictures with me if you make your own rain kilt! This is such a great idea!! Also, thanks for the instructions! Yes! I forgot to mention that part! Thanks, great recommendation. I have the same issue with rain pants and have been looking for something that works better here on the Wet Coast. Hopefully this works well for you. I still like rain pants in cold weather, but was dying in the warmer showers of the summer months! While sweaty legs is still okay -still bearable but sweaty upper body poses major problem! Yes, especially when it soaks through your layers! Great idea and execution! Searching Amazon for Tyvek now! Very ingenious and creative! This is very useful for hiking in the Philippines where microclimates up there result to unpredictable weather. All we need to do now is to find a substitute for Tyvek. Thanks! Hopefully you can find something to work in place of Tyvek! Oh that JMT sign looks familiar! 🙂 Just to make sure that I’ve got it straight what you did, it’s just one big rectangle wrapped around your waist like a sarong? Jax, that’s exactly right. It’s just a rectangular piece of Tyvek with Velcro fasteners. This is brilliant! Been wanting to try a rain kilt, but didn’t want to spend the cash for a cuben fiber one. Much more fun to DIY, and you can’t beat the price. Thanks, Robb! I was in a similar position last year, where I wanted to try a kilt, but didn’t want to drop a bunch of money on a cuben fiber option. This tyvek kilt has worked great. Hi, how is the velcro attached? Is it self-adhesive or did you sew it on? The velco I purchased is self-adhesive and very strong. It bonds well with the Tyvek. Great write up, I’m making one for each of my 5 kids, one question and this may seem obvious, how do you attach the velcro? I bought a small roll of tuber from lowes, one side has the tubeless label on it, is one side more waterproof than the other? I plan on making some rain kilts, and would prefer to have the writing on the inside. Does it matter? Thanks for the question, Foster. I’m not 100% certain, but I believe both sides are water-resistant. Thank you for your response, I just noticed auto correct struck not once but twice in my comment. One more quick Question, and perhaps you’ve already answered this but how does washing tyvek to make it a little softer effect it’s resistance to water? I’m not sure how washing tyvek alters it’s waterproofing. I’ve read online that it can handle multiple washes. I’ve gotten my kilt wet a bunch, packed it up, and used it as a ground sheet, so it’s been used an abused. It still is just as water repelling as when it was new. I made a rain kilt out of ripstop nylon with some interesting features, researching the commercial offerings available. Design features I considered that others might wish to as well. – thin ripstop tent-fly nylon, not crinkly cuben or not-quite-waterproof silnylon. Tyvek is great but I wanted something more durable and less dorky looking. – use of a very lightweight “boning” strip (ask at a fabric store) along the bottom seam, to make that edge of the cone a little more stiff because: (a) so the skirt does not billow around in wind as much and (b) less clammy against my leg skin when it’s damp (a real issue with urethane-on-the-inside nylon and near-plastic cuben; less of an issue with silnylon or tyvek). This is similar to what the author did with tape around the edges. – use fabric strips of preinstalled plastic snaps (ask at a fabric store) for the closure instead of velcro or zippers like the commercial kilts, or nothing like the authors (which requires additional overlapping material). Having a closure should help in wind-blown rain and/or to block wind on chilly windy nights camping. – use *flat* elastic with an adjustable fastex closure for the waistband, instead of round bungee material like most of the commercial kilts, because it will be under the backpack hip belt and pressed hard into my bony flesh: important that it be flat and smooth not small and round and pokey. Now doing it this way took many hours to prototype on paper and then sew (a walking foot was essential on my sewing maching with the slippery nylon). The tyvek design posted here is a great version 1.0 prototype. Yours is definitely a much more polished product. I was going to make a kilt with silnylon and your work has given me a lot of inspiration. Thanks. I made my own tyvek quilt and used it recently on 7 days in the South San Juan Wilderness. I discovered that when tyvek gets wet, it stays wet – for a quite a while. Better silnylon as a material. Thats’s my next project! Thanks for the note. Mine was able to dry out pretty quickly on the JMT, but I didn’t get to test in on consecutive days of rain. I was thinking of making one out of silnylon as well. It’s a great fabric for tents and cheaper than cuben fiber. I haven’t. I put some pieces of it together in my JMT gear guide, but not in a dedicated post. Been checking out these rain kilts and I’m wondering; when your walking in the rain or through wet brush, what’s to keep moisture from the brush or moisture from the exterior of the kilt from draining off of the kilt, getting on your lower legs and running into your shoes? wear homemade gaiters, of course! A little bit of water will drip down on my legs if I’m wearing shorts, but not much. For heavy exposure, a pair of gaiters will keep the drops from getting into you shoes. Why the dimensions of 53″ by 28″? That’s what fits my body. 28″ in length goes below my knee. 58″ in width allows for some overlap to use two strips of Velcro. I am thinking of creating a hiking kilt with a bit more tailoring to allow for trail running movement. Can you successfully sew tyvek or will it compromise the material? Hi Drew, love your kilt! Am going to make one, and a pair of matching gaiters! Tyvek sheathing tape – finding this difficult to source in the UK. Are there any alternatives you could suggest? Thanks! I’d love to see a photo of your gaiters. I don’t know about alternatives to the tape. You might find something similar at your local crafts store.